FIERMAN presents Rock Record, a solo exhibition by Canadian artist Kelly Jazvac. Rock Record features found materials presented both as art objects and as scientific evidence that plastic pollution has irrevocably changed Earth. The show centers on plastiglomerate – a term collaboratively coined by Jazvac, geologist Patricia Corcoran, and oceanographer Charles Moore in 2013—a new type of stone first described on Kamilo Beach, Hawaii, and later identified on beaches around the globe. Plastiglomerate is a hybrid stone produced when plastic debris melts and fuses with naturally-found sediment such as sand, shells, rock, and wood. 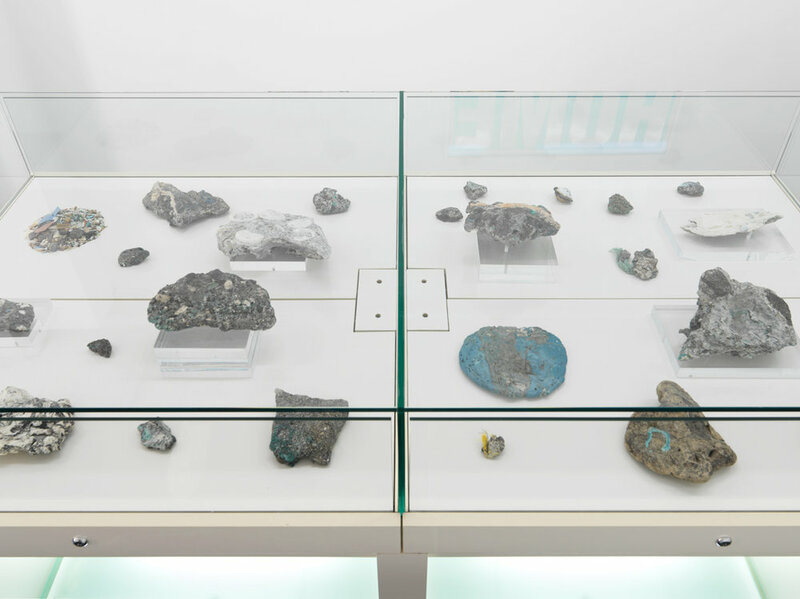 For several years, Jazvac has presented these stones in art galleries and museums, emphasizing their poetic, affective, and pedagogical potential. Through their simultaneously natural and artificial forms, each plastiglomerate works to visualize the dense entanglements of human consumption and the environments that adapt and react to our overwhelming presence. However, these stones are not simply, nor primarily, artworks. They are also scientific evidence of how anthropogenic materials are altering Earth’s geology, as explained by Jazvac, Corcoran, and Moore in a co-authored scientific paper published in 2014. They argue that plastiglomerate has the potential to sink into Earth’s strata: due to the increased density of this plastic-sediment fusion, as plastiglomerate becomes buried, so too will the material be preserved for centuries to come. Both Corcoran and Jazvac are founding members of an interdisciplinary research team that considers the ways in which art and culture can contribute to scientific research. This team works collaboratively to make largely unseen aspects of plastic pollution visible. In doing so, they aim to expand environmental protection efforts by thinking through issues in a cross-disciplinary manner: scientifically, culturally, and politically. 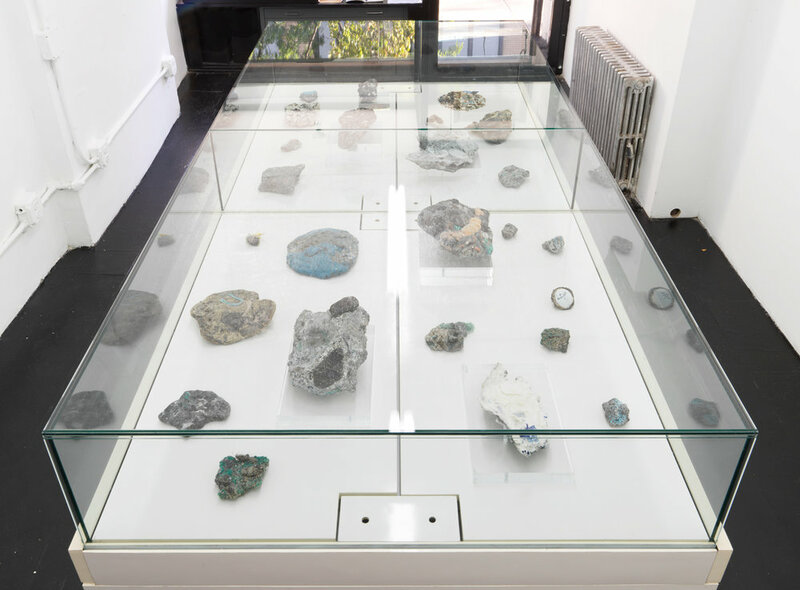 For this exhibition, the original hybrid stones studied through these collaborations are included in an installation with other found objects. The new combination follows connective threads between the production of plastic products that travel through flows of global hypercapitalism – across borders and oceans, washing up on beaches to become plastiglomerate – and attitudes to the commercialization of resources that help to perpetuate environmentally harmful cycles of production. Ultimately, the exhibition works to make visible the earthly consequences of irresponsible pursuits of capital. As an installation presented in a commercial gallery, the exhibition comes with three conditions of sale: the installation may only be acquired by a public institution that supports the potential of plastiglomerate to continue to impact and inform visitors; it may not be deaccessioned without consultation with the artist regarding the relocation of the specimens; and it may not be displayed in a context that argues for the mass production of plastiglomerate as a new resource.